They are at the stockman’s grave, a landmark so old, no one can remember who is buried there. But today, the scant shadow it casts was the last chance for their middle brother, Cameron. Here really is an Australian author to keep your eye on. In this novel she has captured so well the harshness of the Australian outback. The challenges of life on an outback station. The way that in a small community where everyone knows everything, some small incident, that might get lost in the city, damages reputations and blights life for decades. The way that genetics and the harsh environment create character traits that are passed on from one generation to another. It is a book with lots of little mysteries, because in this fractured family no-one really says what they think, because they are afraid. Why is Nathan Bright living in isolation on a small hopeless holding which is never going to amount to anything? Why hasn’t he spoken to his younger brothers for over six months? Did someone kill Cameron or did he die of natural causes? Why is his car 9 km away from his body? This is a book that I thoroughly enjoyed. It is a stand-alone so you don’t have to read her earlier books, but I guarantee you will look for them. 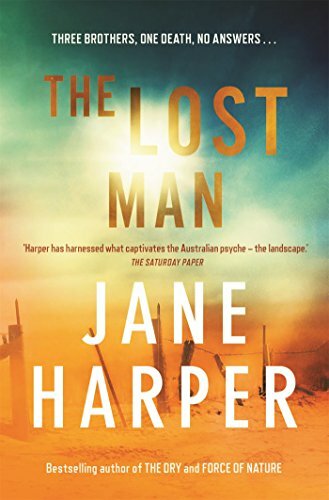 Jane Harper is the author of international bestsellers The Dry, Force of Nature and The Lost Man. Her books are published in more than 35 territories worldwide. Jane has won numerous top awards including the CWA Gold Dagger Award for Best Crime Novel, the British Book Awards Crime and Thriller Book of the Year, the Australian Book Industry Awards Book of the Year and the Australian Indie Awards Book of the Year. Film rights for The Dry have been acquired by Reese Witherspoon and Bruna Papandrea. Jane was born in Manchester in the UK, and moved to Australia with her family at age eight. She spent six years in Boronia, Victoria, and during that time gained Australian citizenship. Returning to the UK with her family as a teenager, she lived in Hampshire before studying English and History at the University of Kent in Canterbury.On graduating, she completed a journalism entry qualification and got her first reporting job as a trainee on the Darlington & Stockton Times in County Durham.Jane worked for several years as a senior news journalist for the Hull Daily Mail, before moving back to Australia in 2008. In 2014, Jane submitted a short story which was one of 12 chosen for the Big Issue’s annual Fiction Edition.That inspired her to pursue creative writing more seriously, breaking through with The Dry at the Victorian Premier’s Literary Awards in 2015. Jane lives in St Kilda with her husband and daughter. 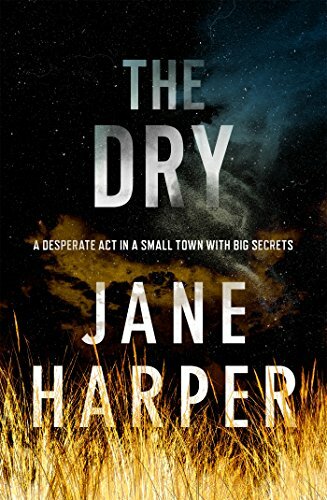 I’m sure all authors wish for the kind of success Jane Harper had (indeed is still having) with her debut novel THE DRY but I imagine most would, at least fleetingly, think twice about wishes coming true when presented with the need to produce the next novel. Happily for Harper, and her readers, she has soldiered through that intense pressure and delivered another cracking read. Among the many things I admire about FORCE OF NATURE is that it isn’t the same novel wrapped in a different skin and some risks have been taken with the narrative choices. One of the things that does carry across though is Harper’s skill at creating a setting with an almost physical presence for the reader. Here we are in a fictional but recognisable bushland area called the Giralang Ranges east of Melbourne. It is isolated, cold and claustrophobic due to the dense foliage. Easy to become lost in. As if that isn’t troublesome enough it is the scene of an infamous series of killings two decades earlier. The perpetrator of those crimes was found but, local legend has it, the killer’s son still roams the area. Into this suitably nightmare inducing setting Harper drops a group of employees from a Melbourne company embarking on one of those corporate retreats designed solely to be such a horrendous experience that staff never complain about their normal office environment ever again. They are separated into two groups – men and women – who must trek through the Ranges for several days on separate, but close, tracks. In the women’s group things go awry and one of them – Alice Russell – goes missing. Being lost in the bush is a well-mined plot line for Australian artists of all kinds but Harper easily holds her own in the space. The storyline is genuinely original, no mean feat in itself, and the way it unfolds adds a lot of tension. There are two strands: one moving forward from when retreat begins and one beginning when the search for Alice gets underway. This dual thread works really well. Adding to the suspense is that we are almost spoiled for choice as to what might have happened to Alice. Has she wandered off? Is she the victim of the serial killer’s son? Did one of the women do her in because she’s not very nice? Or has she been killed because of what she knows? Aaron Falk, an Agent with the financial crimes unit of the Australian Federal Police and protagonist from THE DRY, has been working with Alice as a whistleblower at her company. Her involvement was meant to be a secret but Aaron and his partner, Carmen, worry that her actions may have resulted in Alice being placed in danger. Their superiors are worried that she hasn’t handed over all the documents she promised which endangers their case. So the pair become involved in the search and in trying to piece together what led up to her disappearance. I liked reading about Aaron again and seeing him in a work setting rather than dealing with something personal. Though one of the risks Harper has taken with this book is to make his role somewhat smaller than the traditional procedural might do with its hero. For me this worked well as it allowed us to really get to see the victim’s world and did not bog us down in procedural elements. If the series is to be a long one this is a sound strategy as it means we won’t become bored with the main character. 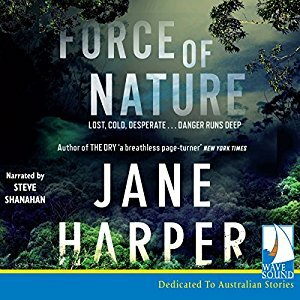 Jane Harper is proving to have a real skill at taking quintessentially Australian settings and making them truly frightening. Not through an overt violence or gruesomeness but by teasing out just enough information to make the reader’s imagination take flight. And telling a ripper yarn. FORCE OF NATURE is good from beginning right through to the end which is, these days, a rarity. If you are an audiobook fan I highly recommend Steve Shanahan’s narration which is outstanding and adds another layer to the storytelling here. 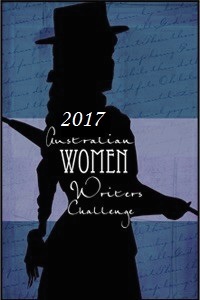 This is the 14th book I’ve read and reviewed for the 2017 Australian Women Writers Challenge. For more information about the challenge check out my challenge progress, sign up yourself or browse the Challenge’s database of reviews. 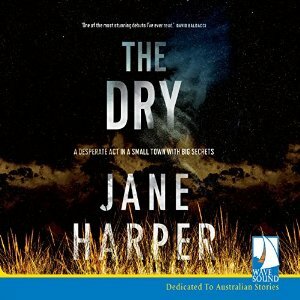 Jane Harper’s THE DRY is well named. The drought-ridden, stiflingly-hot town of Kiewarra and its surrounding farmland dominate the book. Remote. A small population; always someone you know nearby which can be a blessing and a curse. And the weather. Always the weather. Refusing, almost with intent, to give even a hint of relief from heat and dryness and failing to provide the sustenance needed for the farming everyone relies on for their livelihoods. Their lives. First on the scene, the flies swarmed contentedly in the heat as the blood pooled black over tiles and carpet. Outside, washing hung still on the rotary line, bone dry and stiff from the sun. A child’s scooter lay abandoned on the stepping stone path. Just one human heart beat within a kilometre radius of the farm. We are drawn into the story of this place via Aaron Falk. Kiewarra has dominated his life too. He was born there but left as a teenager. Forced out. Literally. After one of his friends had died. Officially she committed suicide but many locals think Aaron played a role in her death. Only something as dramatic as his best friend Luke Hadler’s funeral brings him back 20 years later, after he’s made a life for himself as a Federal police officer in Melbourne. Well that and a veiled threat. Still Aaron plans to be in and out of town pretty quickly but Luke’s parents have other ideas. They don’t believe their son killed his wife, their son and himself. They want Aaron to prove it. Need him to prove it. A lot of crime novels rely on abnormalities to keep readers’ attention. Serial killers with macabre fantasies. Impossibly convoluted crimes. Implausibly brilliant and/or quirky detectives. THE DRY has none of that. Even that horrendous weather is par for the course in the driest continent on the planet. Yet even without gimmicks and quirks, the story is completely gripping. There is such a palpable sense of the hidden here. Some people’s secrets are innocuous – merely an attempt to wrestle some privacy from life in the fish bowl that small town living can be. Others are embarrassing. Others are truly awful. Criminal. Harper does a brilliant job of keeping us guessing about which is which right through the novel. THE DRY is a very modern tale of Australian life that happens to have a crime or two in it. There’s no criminal mastermind at work. Just ordinary people reacting to what they experience. What they think they know. Aaron feeling unable to walk away, wanting to know the truth about his old friend Luke. Once and for all. Luke’s parents wanting to feel like they can look people they’ve known all their lives in the eye again. The local policeman wondering if the murder suicide is really staged or does he just want it to be something unusual. Random locals believing the version of that long ago death that has become folklore. Amidst the powerful backdrop of place these people’s stories could get swamped but Harper brings them all vividly and realistically to life and makes the reader desperate to know what has brought each of them to the point at which we’ve met them. It would be more remarkable that this is a debut novel – because it is about as flawless as they come – except that Harper is a long-time journalist. So storytelling is clearly not new for her. Even so, whatever she produces next will have a lot to live up to. I for one can’t wait. My experience of this truly excellent book was further enhanced via a fabulous narration of the audio version by local voice artist Steve Shanahan. His voice changes for different characters are perfect, his cadence and pacing are natural and he seems to be enjoying the story himself (this is not always the case). This is the 11th book I’ve read and reviewed for the fifth Australian Women Writers Challenge. For more information about the challenge check out my challenge progress, sign up yourself or browse the Challenge’s database of reviews. loath to confront the people who rejected him twenty years earlier. But when his investigative skills are called on, the facts of the Hadler case start to make him doubt this murder-suicide charge. Drought in Australia takes its toll in many ways and many believe that Luke Hadler has just snapped under the pressure. When Aaron Falk comes to the town for the funerals, he intends to get away as quickly as possible. But Luke’s parents ask him to try to work out what triggered the murder/suicides, and then Falk meets a local policeman who is having a hard job accepting that Luke Hadler killed his family. Aaron Falk and his father left the rural Victorian country town after the death of one of Aaron’s friends. The final verdict was that Ellie had actually committed suicide, filling her shoes and pockets with stones, and drowning herself in a local swimming hole. Aaron and his father were questioned in connection with her death and then hounded out of town by Ellie’s father. Now, twenty years on, the old rumours resurface and many townspeople treat Aaron with hostility and suspicion. This is a really well constructed novel, with a number of credible red herrings, and then a final solution that really comes out of left field. Australia and the UK. She lives in Melbourne and writes for the Herald Sun, among other publications. Winner of the Victorian Premier’s Literary Award for an Unpublished Manuscript, The Dry is her first novel with rights sold to over twenty territories.